Honduras with its capital Tegucigalpa is located in North America (Central America, bordering the Caribbean Sea). It covers some 112,091 square kilometers (slightly larger than Tennessee) with a population of 9,038,740. Spanish is the official language spoken by people in Honduras. El Salvador, Guatemala and Nicaragua are bordering countries. Honduras is the second biggest country in Central America. It has colonial villages (Gracias, Comayagua), ancient Maya ruins (Copan), natural parks (Moskitia), and a Pacific and Caribbean coastline and the Bay Islands, with great beaches and coral reefs where snorkeling and diving are exceptional by any standard. Good amenities can be found in cities like Tegucigalpa, San Pedro Sula, La Ceiba, Tela, Utila, Roatán and at Copan, but elsewhere conditions can be quite basic, especially in the rural areas. Nevertheless a visit is worthwhile, especially to the ancient Maya ruins in Copán, the colonial towns of Gracias and Comayagua, and the fantastic Caribbean Coast. To reach someone Honduras dial +504 prior to a number. The local cellular networks are operated on 850 MHz, 1900 MHz, 3G, 4G. Websites typically end with the top level domain ".hn". If you want to bring electric appliances (e.g. battery chaarger), keep in min the local 120 V - 60 Hz (plugs: A, B). The sign for the locally used currency Lempira is HNL. 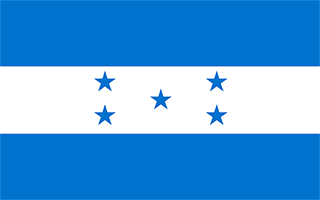 Three equal horizontal bands of cerulean blue (top), white, and cerulean blue, with five cerulean, five-pointed stars arranged in an X pattern centered in the white band; the stars represent the members of the former Federal Republic of Central America: Costa Rica, El Salvador, Guatemala, Honduras, and Nicaragua; the blue bands symbolize the Pacific Ocean and the Caribbean Sea; the white band represents the land between the two bodies of water and the peace and prosperity of its people.